Herakles (also spelled Heracles) is the real Greek name for this hero, but the name of the constellation is Hercules, the latin form of the name. Herakles was the son of the Zeus, highest of the gods and of his lover Alcmene. When Hera, jealous wife of Zeus, discovered the boy was her husband's child, she grew enraged and wanted to eliminate the baby immediately. She didn't want to use her own hand, because she didn't want Zeus to suspect her. First she tried to kill the baby by sending snakes. Herakles had a twin brother named Iphicles (he was the son of Alcmene's husband, Amphitryon). One night, as the babies slept in their crib, Hera sent two dangerous snakes to the nursery. They coiled around the crib, flicking their tongues, when Iphicles woke up and screamed. Herakles woke, sat up, and grasped the deadly serpents by the throat. The creatures struggled, wrapping around Herakles' body, but he held them tightly. Alcmene heard Iphicles' screams and rushed to the nursery. To her surprise, she found Herakles sitting in the crib, laughing happily, and holding a long, limp body in each hand. Amphitryon entered the nursery, and inspected the snakes...they were dead. Both knew then that Herakles was destined for greatness. Herakles received a good education, but had a few accidents along the way. He accidentally killed the music teacher by "lightly" tapping his head with the lute. Herakles was very very sorry, but that didn't stop him from doing the same thing again and again, because he did not realize his deadly and powerful strength. Herakles married the Princess Megara (daughter of king Creon of Thebes). He was devoted to her, and to their three sons, yet this marriage brought upon him the greatest sorrow of his life. Vindictive Hera hated that Herakles lived in joy with his family. She sent an insanity upon him. Struck by the madness, he killed his sons and wife, who was trying to protect the children. When his sanity returned, he found himself standing beside the dead bodies of his family. He had no idea what had happened and demanded to know how they had been killed. One of the witnesses explained everything to him. Herakles was so devastated that he wanted to kill himself to avenge their deaths. His friend Theseus came and talked him out of it, though, it took quite a long while to do so. Herakles then went to consult the oracle of Apollo in Delphi. She told him he needed to be purified, and only a dreadful penance could accomplish that. She commanded him to see Eurystheus (King of Mycenae), and submit to whatever he demanded of him. Herakles was ready to do anything. King Eurystheus obliged by devising a series of penances known as "The Twelve Labors of Herakles." Eurystheus had help, when planning the penances; Hera assisted him, she who never forgave Herakles for being Zeus' son. The first labor, the killing of the Nemaean Lion, can be found here. Click here for the second labor, the slaying of the Hydra. Click here for the third labor, the capture of the stag sacred to Artemis. Click here for the fourth labor, the slaying of the boar of Erymanthus. Click here for the fifth labor, the cleansing of the Augean stables. Click here for labors six through nine. Click here for the tenth labor, a journey past the Pillars of Hercules. Click here for the eleventh labor, another journey to the ends of the earth. Click here for the twelfth labor, a journey out of this world. Each map can be clicked on to produce a 909x1199 version of it. They sport red labels, which look good on screen, but which disappear when used with red flashlights. Each map, therefore has a second link to a map better suited for printing in a graphics program, and using in the field. While they are quite large, they are all about 25-50k, and so are easy to view at today's modem speeds. The first map is a wide area view of the constellation, suitable for naked eye browsing. The next views are binocular width, showing stars to mag. 10, deepsky objects to mag. 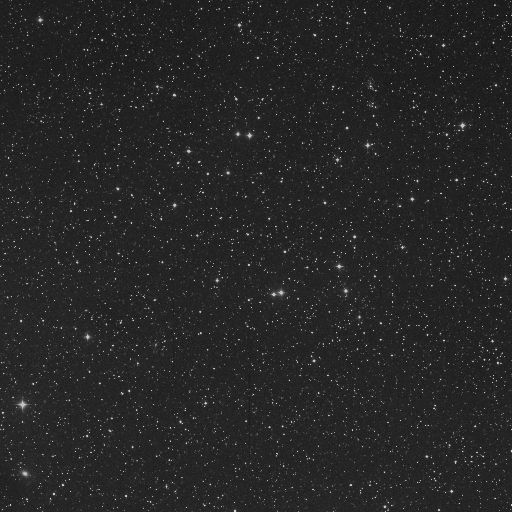 12.9, and labeling deepsky objects to magnitude 12. 94k JPEG This is an image of M13 (NGC6205) and the galaxy NGC6207. Just under .5° separates them. Tiny IC4617 lies mid way between them, and requires a 12" and dark skies. M13 is a globular described by Dreyer as extremely bright (mag. 5.9), very rich, progressing to an extremely condensed center. The size is 17'. Star brightness is about mag. 11. In short, this is a wonderful cluster. NGC6207 (Best 55) is a mag 12.2 galaxy, sized 3'x1'. It has a bright core. Look for other galaxies in the larger image. 72k GIF M92 (NGC6341) is a highly resolvable globular cluster in northern Hercules. Shining at mag. 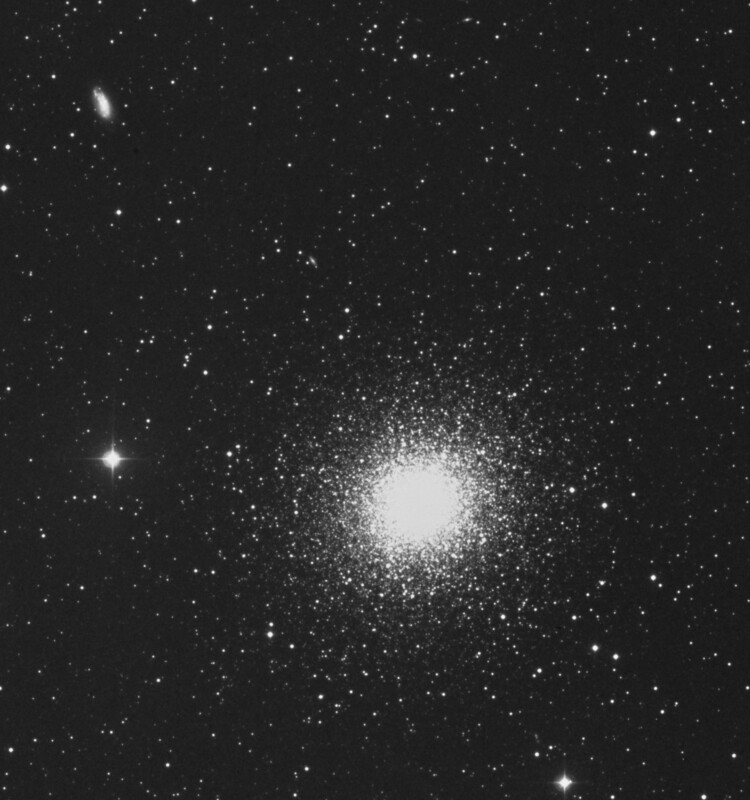 6.5, and covering 11.5', it is a prettier globular than its larger companion, M13. The photo was taken (on a 6" refractor?) focal reduced from f/12 to f/6. 60 seconds on the ST-6. Note the faint stars reached due to the sensitivity of the ST-6. Also note that a good optical system can give great results with LARGER PIXELS in a lot less time (the photographer is commenting on a later generation of Kodak CCD chips that use more and smaller pixels than the CCD chip in the ST-6). No processing applied except for flat field and dark frame. 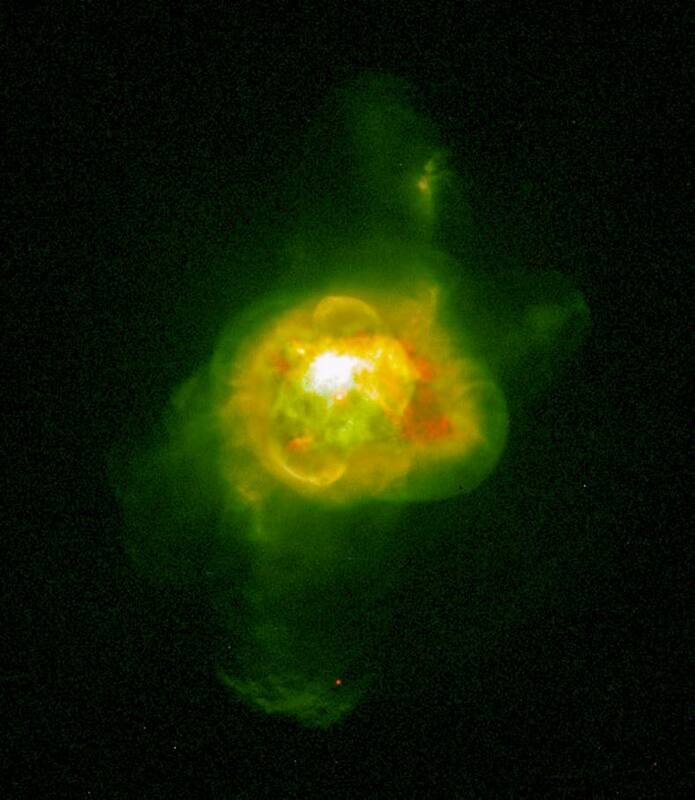 NGC6210 (Best 56) is a planetary nebula located in south-central Hercules 4° north-east of Kornephoros (Beta Herculis). The Dreyer description reads: very bright, very small, and round. Dreyer continues with the cryptic remark of "disc" & border (nucleus variable?)." Observers today see an almost stellar central zone surrounded by a fainter outer zone. Larger aperture (12") and averted vision is required to see the outer "border" region. The central star should be visible in an 8". Image to the left is a drawing by Jere Kahanpää from observations through an 8" telescope. Image to the right is from the Hubble Space Telescope. 62k JPEG Dolidze and Dzimselejsvili 9 is an open cluster located 2.8° north of Omicron Herculis near the border of Lyra. It contains about 15 stars in a 34' area. There may be as many as 50 fainter, background stars.